The lighter side of Frost! One of the trio of Frost programmes that dominated ITV weekends in the late 1960s and early ’70s, Frost on Saturday concentrated mainly on topical interviews with entertainers and public figures. Made at a time when David Frost was working in the US and then jetting back to the UK to do three shows over the weekend, Frost on Saturday concentrates his energy into a forty minute mix of humorous interviews, debates and musical interludes with the likes of John and Yoko, The Rolling Stones (playing ‘Sympathy for the Devil’ in a barnstorming performance), Edna Everage (back when she was a mere Mrs. and not a Dame! ), George Best (who plays football with Frost in the studio), Frankie Howerd, Dusty Springfield, Sir John Betjeman and more. 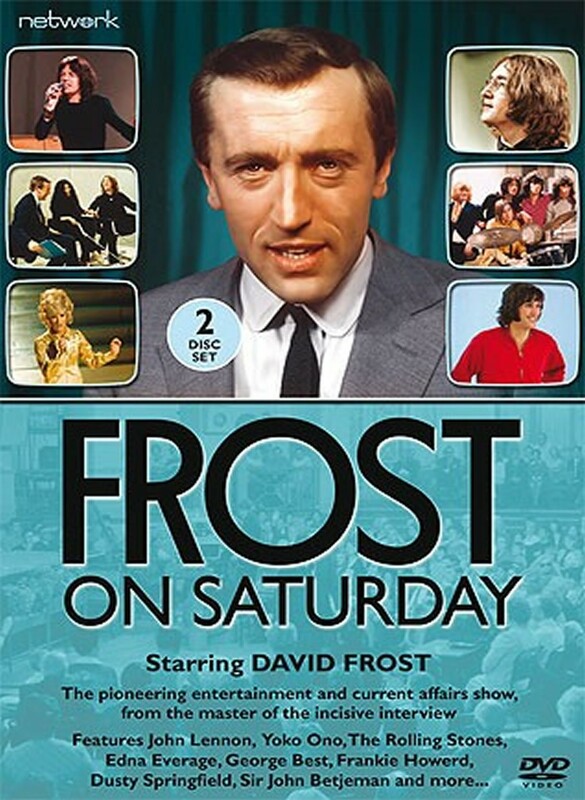 A number of editions of Frost on Saturday no longer exist - this set includes the seven surviving shows, including a special programme from November 1969 to celebrate the history of broadcasting on the first official night of colour transmissions on ITV.